Disclaimer: If you haven't read the readme I will not help you with any problems you may encounter. Use a utility such as WinZip to extract the contexts of the archive, for the simplest and quickest install, put the contents of the "Override" folder into your games Override folder (default: C:\Program Files\LucasArts\SWKotOR\Override). Also included is SithSpectre's awesome flowing cape modification, which gives the Revan model the flowing cape and fixed animation! then place this file in your Override folder, if you are asked to overwrite a file in the Override say "yes". Revanoriginal.tga - This has a closer colour scheme to Bioware's original model with the sash and armour colour made that more dull purple colour. Delete all the files contained in the "Override" folder of this archive and the modification will be uninstalled. This modification reskins Revans Robes and makes them available in game on the body of Nemo, they also include within their description the reason why Nemo was carrying them on his person at the time of his unfortunate death. 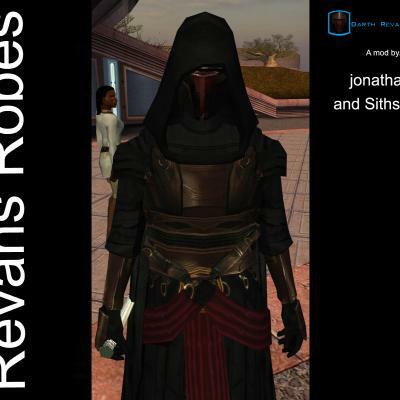 This modification will be incompatible with other mods which modify the RevansRobes texture, to be compatible with SithSpectre's Revans Flowing Cape modification, which has the texture embedded in the model, the textures have to be called "pmbj01.tga" - This means this will be incompatible with other modifications which edit this particular model. RedRob, Quanon, Jae Onasi, Darth Insidious, Inyri Forge, Astor, Darth_Dak, Druganator, The-Seraphim and many others who commented on improvements to the Robes. Darth333 - she's awesome... the end! Goes to Rob at www.mywickedarmor.com for permission to use his awesome textures, be sure to check out all the cool star wars costumes he's come up with! PERMISSIONS: PM me at LF to discuss usage in a mod.